A Series 5500 CruiseMaster Fuel Monitoring System will increase any boats effective range by accurately recording total fuel consumed by pinpointing optimum speed. Now you can spend more time fishing or cruising knowing you have enough fuel to make it to port. CruiseMaster brings you more than peace of mind and increased cruising range, it also pays for itself in better fuel economy. Fits virtually all inboard, I/O, and gas outboard engines. Features Self contained Totalizer with permanent LCD display records fuel consumed up to 99,999 gallons. Resettable or non-resettable totalizer operating mode. SPST type switch required for resetting totalizer. Model 20B Flow Sensor with solid state signal generator for maintenance free use. Installs between tank and fuel pump. Model 231 Flow Sensor features extremely low flow resistance. Recommended for carbureted and 2-stroke EFI outboard engines 150 HP and over where system flow resistance should be minimized. Installs between priming bulb and fuel tank. Microprocessor-based electronics with user adjustable totalizer calibration for superior accuracy. Panel mounted instrument fits 3-1/16" diameter opening. Models available with 0-5, 0-10, 0-20, 0-32, 0 -50 , and 0-100 GPH scales. HP rating will determine the best GPH scale to use . Twin engine models show the individual flow rates to each engine with an external toggle switch. The totalizer records the fuel consumption of one or both engines and can be reset with an external toggle switch. Applications Fits all carbureted inboard and stern drive engines up to 350 hp. Fits all EFI inboard and stern drive engines (including Mercruiser and Volvo) with closed loop fuel return systems. Fits all Mercury Optimax, Evinrude E-TEC/Ficht , Yamaha HPDI, and Honda 4-stroke engines. Fits all 2-stroke EFI outboard engines. 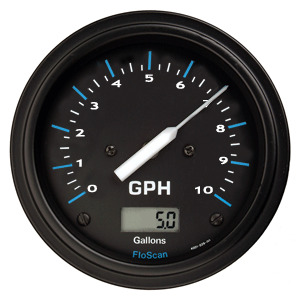 A Series 5500 CruiseMaster Fuel Monitoring System will increase any boats effective range by accurately recording total fuel consumed by pinpointing optimum speed. Now you can spend more time fishing or cruising knowing you have enough fuel to make it to port. CruiseMaster brings you more than peace of mind and increased cruising range, it also pays for itself in better fuel economy. Fits virtually all inboard, I/O, and gas outboard engines. Self contained Totalizer with permanent LCD display records fuel consumed up to 99,999 gallons. Resettable or non-resettable totalizer operating mode. SPST type switch required for resetting totalizer. Model 20B Flow Sensor with solid state signal generator for maintenance free use. Installs between tank and fuel pump. Model 231 Flow Sensor features extremely low flow resistance. Recommended for carbureted and 2-stroke EFI outboard engines 150 HP and over where system flow resistance should be minimized. Installs between priming bulb and fuel tank. Microprocessor-based electronics with user adjustable totalizer calibration for superior accuracy. Panel mounted instrument fits 3-1/16" diameter opening. Models available with 0-5, 0-10, 0-20, 0-32, 0 -50 , and 0-100 GPH scales. HP rating will determine the best GPH scale to use . Twin engine models show the individual flow rates to each engine with an external toggle switch. The totalizer records the fuel consumption of one or both engines and can be reset with an external toggle switch. Fits all carbureted inboard and stern drive engines up to 350 hp. Fits all EFI inboard and stern drive engines (including Mercruiser and Volvo) with closed loop fuel return systems. Fits all Mercury Optimax, Evinrude E-TEC/Ficht , Yamaha HPDI, and Honda 4-stroke engines. Fits all 2-stroke EFI outboard engines.